RoxRoy Salmon is a Brooklyn father and community activist resisting deportation so that he can remain with his US citizen family. Earlier this week, on 8/18, Roxroy Salmon was scheduled to turn himself in to Immigration and Customs Enforcement at 26 Federal Plaza. Members of First Presbyterian Church in the City of New York, Families for Freedom, and the NY New Sanctuary Coalition stood in vigil outside the federal building. We did not see Roxroy enter the building and can only assume that he made the deeply personal decision to not show up. Even in the face of this, our work in the movement for immigrant justice in the United States forges ahead. Over the past two years Roxroy’s Defense Committee built a campaign to try and help keep his family together by working to stop his deportation. Our efforts included gathering petition signatures, holding vigils, writing letters and garnering the support of many clergy and community leaders. As we held vigil again on 8/19 to reflect and heal, we reaffirmed our guiding principles that dividing families is immoral and unjust and we will continue onwards in the fight for immigrant rights. At least one individual or organization fasted each day from March 8 to July 7, 2009 as RoxRoy fought to avoid a deportation order. Scroll down this page to contribute, or to read reflections from other fasters. If you want to see latest press coverage, background on RoxRoy’s case, or how to get involved, you’ve come to the right place. This blog is maintained by RoxRoy’s Defense Committee, an ad-hoc gathering of representatives from the New Sanctuary Coalition, First Presbyterian Church and Families for Freedom in New York City. Tomorrow is the day when we will learn whether our elected representatives have been successful in averting Roxroy’s deportation scheduled for Tuesday, Aug. 18th. Since Roxroy received his order to appear for deportation just 10 days ago, I’ve had a ball of fear in the pit of my stomach while anger and prayer vie for supremacy. It seems unbelievable to me that such a loving husband, father and grandfather, could be separated from his children in 2 days. This past week Roxroy and his supporters have fought to get meetings with congressional representatives and senators in a desperate attempt to head off his deportation. I could not attend any of the delegations because of my daughter’s pregnancy, and so have mostly waited and prayed and talked with those presenting Roxroy’s case. Tomorrow we will know . . . I repeat over and over: “I lift my eyes to the hills. From whence does my help come? My help comes from the Lord, who made heaven and earth . . . The Lord will keep you from all evil; he will keep your life. The Lord will keep your going out and your coming in from this time forth and for evermore.” May God be with you, Roxroy. We love you. HUNDRED, who in May 2009 protested for just one edible meal a day. nurture the elements that make life worth living. body and soul. I look forward to the escalation. Round 2, bring it. I’m fasting for RoxRoy because I don’t know what else to do. Because I see how many hours have been dedicated to stopping RoxRoy’s deportation and yet we still tread so solemnly towards the 7th, the day of his last hearing. All of this time and energy to try to stop the deportation of one dad whom we have come to know and love. All of this time and energy required to at least resist what the system threatens to do to his family…while hundreds of thousands of dads today are trudging in his same heavy shoes. I fast for strength. I fast to remind myself – as RoxRoy always reminds me – that the Spirit is the true advocate and the true reality from whom we derive our hope. It’s not about the petitions or the letters or the long meetings – it’s about the Spirit running through them and bringing us closer to each other. I fast to be brought closer to that primal reality, which is a comfort and guide in these worrisome days. Who will tell RoxRoy’s baby granddaughter, London, where “YaYa” has gone? 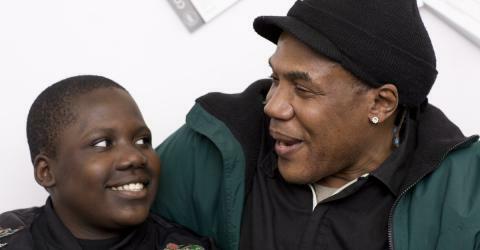 Who will explain to 13-year-old Elijah why his dad has been taken when he most needed him? Who will account for so great a loss? Because RoxRoy’s spirit cannot be detained. Because RoxRoy’s love cannot be deported. I am fasting to remember that mountains can move. When I fast the issue of hunger comes up for me. Initially I was hearing from my own stomach. Then I began to think about what Roxroy must hunger for. I imagine him hungering for a sense of peace about his status in the US, hungering for a just and fair resolution for his upcoming case in July, hungering for a time when his family can rest from anxiety and concern. I pray that some of these hungers may be removed on July 7, 2009. Father’s Day is ultimately about families. It marks a day in which memory can play a big part, but it was a sobering experience in the rain today to hear from children to whom memory is the only way they can “enjoy” their father. It isn’t our common mortality that has snatched their father away. It is unjust laws, laws that would seem to violate other laws of two hundred years’ standing, those other laws we thought were sanctified by the thousands who poured out that last measure of devotion purely to safeguard this two-hundred-year heritage. All that heritage violated by the sharp knock at the door. I fast today in memory. Some of the memories I have are memories of my father, a history professor whose work often reminded me that history is always around us. History isn’t in a cubby-hole over there. We live history, each of us. We cannot escape it. Maybe our own American history will always be an agon, an agon in which the urge to expand community will always contend with the urge to shrink community. I often find that a depressing thought. What was especially painful in the Children’s Vigil today was to recall what the mindless urge to shrink community may do to Roxroy’s children. There they were today with their father, all of them often smiling. Did it cross their minds — well, it crossed mine — that this could be the last Father’s Day they have together? Something so ordinary suddenly becoming so precious. The last cup of coffee brought to their father on a Saturday spent outdoors. The last time they make signs together. The last time they live anything outside their daily routine together. Hate attacks the ordinary. That is what hate does in the ’96 legislation. It deprives Americans — child citizens — of the ordinary. Is there only one way, then, for us to prize the ordinary as precious too? Must that one way be deprivation of the normal? Can nothing be held precious precisely because it is normal? Isn’t that a saner way? To hold something precious because we can have it every day? We thought — many of us — that we had the Constitution and the Bill of Rights every day. Did that make them less precious? I know, I may be falling into something a little too close to despair. Is it just because I’m hungry? 🙂 Not all these thoughts are draining, though. Memory can also bring up things that keep us going. My father would often say, when I’d get too serious, “The purpose of life is to have fun.” Well, right now, today, Roxroy and his children seemed to have fun. The excitement, talking to the crowd as a family, valuing the help of strangers, as Roxroy reminded us as we were getting ready to go — all this was fun. And, as much as this may sound like a cliche, it was living in the Now. So I’m grateful for this day. And even though I may be grateful for this day because of the real likelihood that there will never be another like it again, I hope I can be just as grateful for it if we end up celebrating another just like it next year. Representatives from: Congressman Jose Serrano’s Office, Congresswoman Yvette Clarke’s Office, State Senator Jose Serrano’s Office, New York City Councilwoman Melissa Mark-Viverito’s Office, and MORE! Community Organizations: the American Friends Service Committee, Children’s Defense Fund, Northern Manhattan Coalition for Immigrant Rights and many more organizations!